So firstly I was really excited to try this product because if you saw the blog post where I spoke about getting this L`Oreal Goodie Bag, you would have seen that I had been thinking about trying a clay mask for a while now. I was really excited to try this product !!!!! 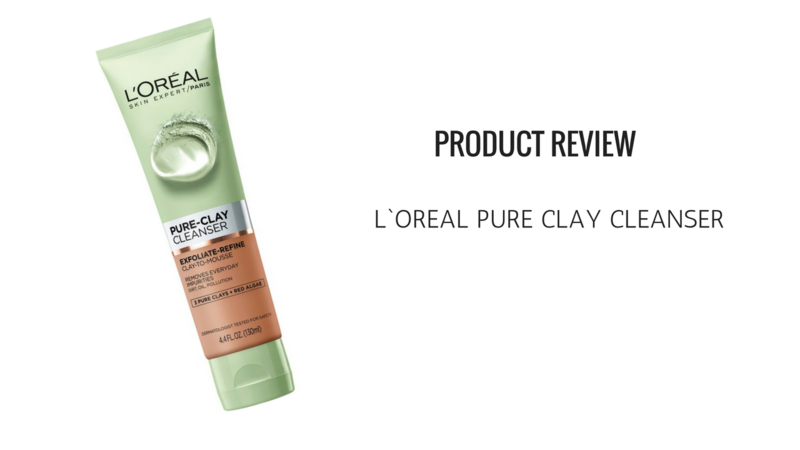 The only thing is …..I actually saw the word “Clay” on the product and thought it was a Mask but on the contrary, it is actually a Pure Clay Cleanser. I got the red one and this is the one that is supposed to “Exfoliate and Refine”. The package is pretty nice and cute, so now it`s just to see how the product works. Another surprise here !!! I thought I would just be rubbing the clay on my face and rubbing it off . Wrong !!!! Again, another result of not reading !!!! LOLOLOLOLOL. So how this cleanser works is it actually comes out of the tube in a drier clay formula and you have to add water before applying it to your face to cleanse your face. I did this and the clay turned into a nice moussey-ish liquid which I then applied to my face just as I would a normal cleanser. I don`t know about the other persons who used this product but I was actually really excited about the colour of the clay !!! It was a beautiful sand pink colour and that made me even more delighted to use it. It applied really easily on my skin but I was mindful to not apply as much pressure as I would with a Gel Cleanser because the clay had a sandy texture (there are some really tiny particles in the clay to exfoliate the skin ) and I didn`t want to be too harsh on my skin. I found the clay started to dry on my face really quickly ….maybe within less than 3 minutes…..and I allowed it to dry because I liked that sensation on my skin. After a few minutes I rinsed it off and it came off pretty easily. As for the scent….it smelled like ….well ….clay, which I liked. I don`t know if it was some kind of optical illusion but when I washed off the clay I felt like my skin looked refreshed, smoother, more even and brighter. I was literally AMMMAAZZEEDDD !!!! And I was pretty excited that after wanting to try a clay product for quite some time…it did not disappoint !!!! I am excited to have this clay cleanser and I will be using it in my facial routine going forward. I LOOVVVVVEEEEE THIIIIIISSSS PRODUUUUCCCTTTT !!!!!!! I would say this is a great product for cleansing the face and refining the overall texture and appearance of the skin. It makes the face look smoother and more even. I believe on the package it says you could use it daily but for me personally, and being aware of my own skin, I would not use this product every day. I would use it weekly or even every other two weeks because of the texture of the clay and exfoliating effect. I would not want to over exfoliate my skin. But each person would be able to decide what frequency is suitable for them. I definitely endorse this product !!!! !